The interview was thought to be lost for many years, as the master tape of Jobs’ interview was misplaced while being shipped from London to the US in the 1990s. Luckily, “Triumph of the Nerds” director Paul Sen eventually discovered a VHS copy of the interview in his garage, allowing the interview to be distributed online. In the interview, Jobs discusses a range of topics, including how innovation can die out at large tech companies where marketing and sales are prioritised over disruptive innovation. Jobs used the example of Pepsi, which didn’t often release new products except for different-sized bottles, so sales and marketing people would be the ones to get promoted and effectively run the company. It turns out the same thing can happen in technology companies that get monopolies, like IBM or Xerox. If you were a product person at IBM or Xerox, so you make a better copier or computer. So what? When you have monopoly market share, the company’s not any more successful. So the people that can make the company more successful are sales and marketing people, and they end up running the companies. And the product people get driven out of the decision making forums, and the companies forget what it means to make great products. The product sensibility and the product genius that brought them to that monopolistic position gets rotted out by people running these companies that have no conception of a good product versus a bad product. They have no conception of the craftsmanship that’s required to take a good idea and turn it into a good product. And they really have no feeling in their hearts, usually, about wanting to really help the customers. 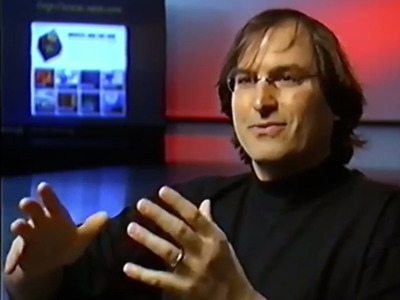 At the time of the interview, Jobs was still running NeXT, which he would sell to Apple 18 months later before eventually returning as CEO just a few months after that. You can watch the clip of the interview below, or you can watch the full interview over at Dailymotion (Part 1 and Part 2).